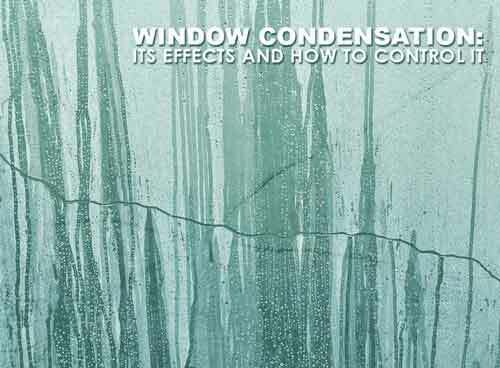 Window condensation, or “sweating” windows, refers to excess water vapor or humidity that comes into contact with a cold surface — such as window glass — forming water droplets. It’s not unlike the droplets that form on a cold bottle of beverage that’s been sitting in room temperature. This is a common occurrence on all homes and should not be a cause for concern, but certain materials help prevent condensation better, so you might want to hold off on that wood window replacement in Detroit, Michigan, until after you read this. You may have already come across articles or videos that detail the effects of excessive condensation: moisture spots on the ceilings and walls, frost, peeling paint, and cracked plaster. Condensation on windows and mirrors are obvious, but these are merely indicators of what the real problem is: excessive humidity, not windows per se. Humidity comes from everything in your home that involves water: showers, heating and cooling system, humidifiers, steam from cooking, laundry, even the simple act of mopping the floor. All of these contribute moisture to the air, which condenses when temperatures drop below 35 degrees. This is why the first few summer months are so humid: your home “perspires” as the temperature increases. The same thing happens when home improvement projects like wood window replacement in Detroit, MI, are completed. The new building materials have high moisture levels. Having identified the cause, the solution becomes apparent: dehumidify. Here are some home strategies that you can use aside from buying a dehumidifier. When you cook, bathe and do the laundry, use exhaust fans to vent moisture outside. Aerate your home periodically by opening your windows for a few minutes. The fresh air also helps reduce odors. Do the same for the attic and basement. Reduced humidity can make your home much more comfortable and reduce condensation on glass surfaces. For Detroit, MI, wood window replacement and other home improvement projects, call Kroll Construction at (888) 338-6340 or fill out our contact form to schedule a free consultation.